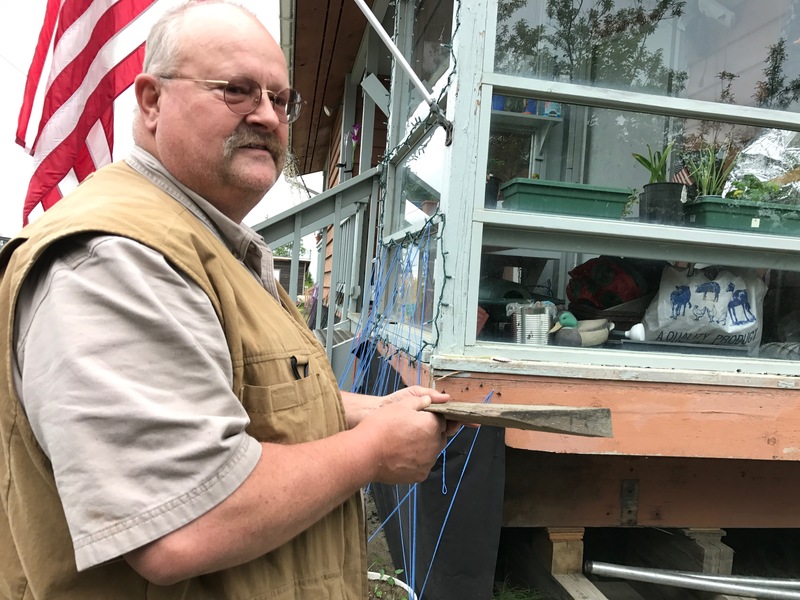 “When you lose the tundra, you lose your insulation,” said Mike Salzbrun, owner of foundation and geotechnical contractor Salzbrun Services and Drilling, with decades of experience on the Y-K Delta. Permafrost here is considered “warm,” maybe a fraction of a degree below freezing, so it’s sensitive to just a slight warming of the air, said Vladimir Romanovsky, geophysics professor and permafrost researcher at the University of Alaska Fairbanks. “Now we are going to depths of 35 feet,” Salzbrun said. “There is a definite change,” said another Bethel contractor, Rick Hanson of T and H Leveling. Out here, leveling a building doesn’t mean bulldozing it to the ground but, rather, making it level again. As permafrost under a structure thaws, strange things happen. Permafrost is laden with ice but it’s not uniform and much about it is still unknown, Romanovsky said. Watery voids create instability where ice once held firm. “People can’t close their outside door. That’s when they call and say, ‘Hey, I got a problem,’ ” Hanson said. The whole house might sink so much that a wastewater line no longer has enough slope. Tubs won’t drain well. Toilets need repeat flushes in a town where many people ration their home-delivered water. Low spots in pipes become bellies that trap wastewater, then freeze and burst in wintertime. Between the active freeze-thaw layer and the permafrost, there used to be another section that didn’t refreeze each winter. In recent years with little snow, that layer freezes too, heaving what is above. “It really makes a difference in the way things jack around,” Salzbrun said. 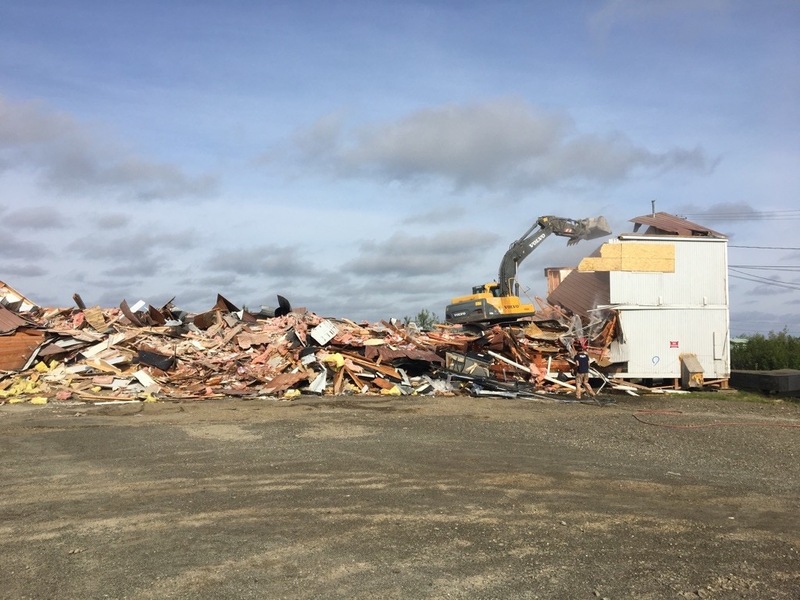 In the heart of Bethel, the Office of Children’s Services building shifted last year due to permafrost thaw and freeze. In October, it was leveled, like it had been periodically, but this time the interior was damaged in the process, said Sharon Lechner, president of the company that owned the building, Tunista Inc., a subsidiary of Calista Corp. After disagreement on what to do, the state lease ended early, she said. In June, the building was demolished. 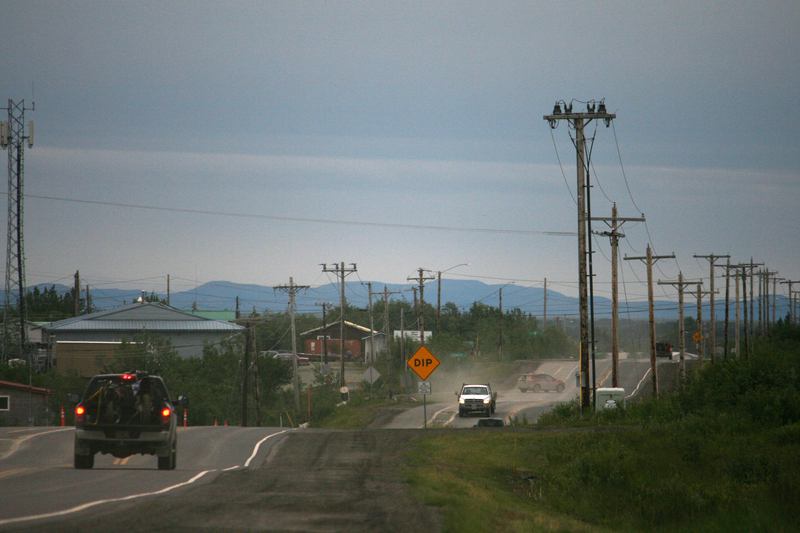 With warming, thawing and refreezing, people involved in Yukon-Kuskokwim Delta construction and maintenance believe more buildings are shifting, and doing so to a greater degree. There’s no hard data yet but that may come. Under the existing hospital, the permafrost stays frozen in some areas but has thawed near the perimeter. For the building expansion, engineers evaluated whether to add thermal probes, which extract heat and keep the ground frozen for stability, said Kent Crandall, with the firm Arcadis and the project manager for YKHC. Or they could drill down 110 feet for steel supports, deep enough that the ground didn’t have to remain frozen for the three-story addition to be stable, he said. No one wants this building to move. “That design assumed that everything would all thaw in the long run,” Crandall said. “It’s a fact we’ve disrupted the balance,” Crandall said. Maintenance workers this summer installed warning signs. One near the airport alerts drivers to dips for the next 4 miles. “Bump,” says another. 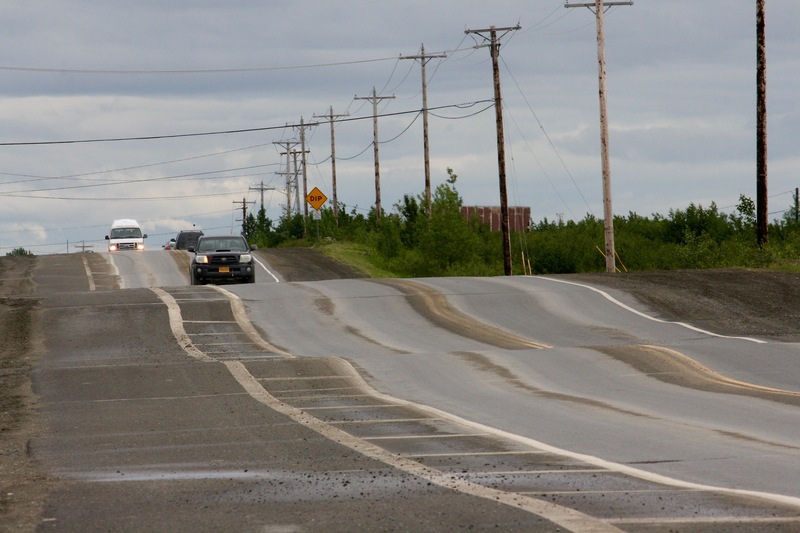 “That would be a rough road anywhere in the state,” said Scott Thomas, a regional traffic and safety engineer for the Alaska Department of Transportation. Cab drivers and others who make frequent trips say it’s a jarring drive but at least the pavement is intact. “We don’t want to induce labor,” he said. It’s true that a gravel road can be more easily evened out but it also requires more day-to-day maintenance, he said. Plus, gravel is dusty and has to be replenished regularly, said Bethel Mayor Rick Robb.